I'm in a bit of a reading frenzy these as I research my own book on search marketing. In all this reading, one book that has really caught my attention is +Rob Garner's +Search and Social. It's all about the mechanics of discovery on the world wide web. I want to devote this post to thinking about reach. Think of reach as meaning how many people you can reach using a particular medium on the web. 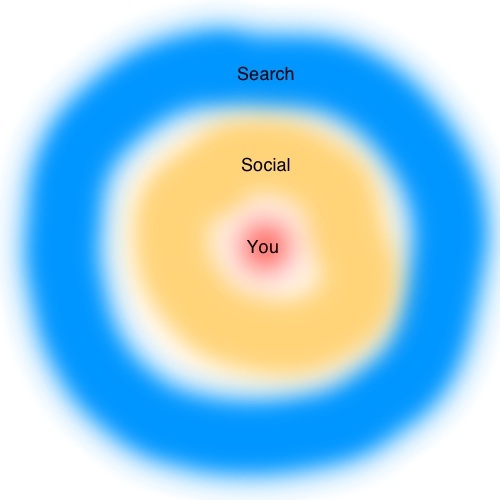 As illustrated in the diagram, search has the greatest reach. It will hit people who are not connected to you in any way whether that be knowing you personally or through your extended social network. Search will also represent you in a way tailored to the person searching. This feature makes it a very arms-length method of engaging your potential customers. You have to do it on their terms and you are presented as one in an array of options. Your extended social network has the second greatest reach. These are people who know people who know you. Again, you're likely to be presented in a more arms-length off-hand way, but there is also more likely to be an element of personal recommendation or opinion. People know the people involved and have some opinion as to their worthiness. Further, the consideration set is likely to be smaller. Finally, there is the set of people directly connected to you. This is the smallest set of the three, but it is also the most engaged, either positively or negatively. People connected directly to you are going to broadcast out into the other layers, impacting their effectiveness in garnering you new visitors. Often web marketing efforts, such as pay per click advertising or twitter hashtag campaigns are directed at gaining you visitors and giving them direct experience with you. Just be aware that that can be a double-edged sword.